"I love bones," said Cabot artist Janet Van Fleet as she surveyed her latest solo exhibition. "I think I'm almost over bones," she added. Though Van Fleet's demeanor is far from morbid, her work reveals a straightforward preoccupation with questions of violence and decay, salvage and reclamation. Her show "Long Haul," which opened last week at the AVA Gallery and Art Center in Lebanon, N.H., consists of 11 long, trough-like wooden frames suspended at different heights and swaying gently. They have a distinctly procession-like quality. "It's all going in one direction," Van Fleet said cheerfully of her mixed-media collection. "It's all going towards death and dissolution." One frame holds a piece titled "Baggage," in which roughly hewn characters appear to be riding on a boat; they're made from blocks of, yes, bone, as well as wood, stone, metal parts and natural specimens. All carry the baggage of their lives: A hunk of gleaming black coal has an iron teapot; a figure made of hinges and hardware has a tiny wooden house. Where Charon, ferryman of the Underworld, might stand is a smooth piece of flame-shaped glass. While Van Fleet's latest series takes a big-picture approach, it also communicates much about the artist's own "long haul," both in terms of finding long-term creative freedom and developing a distinct aesthetic sensibility. 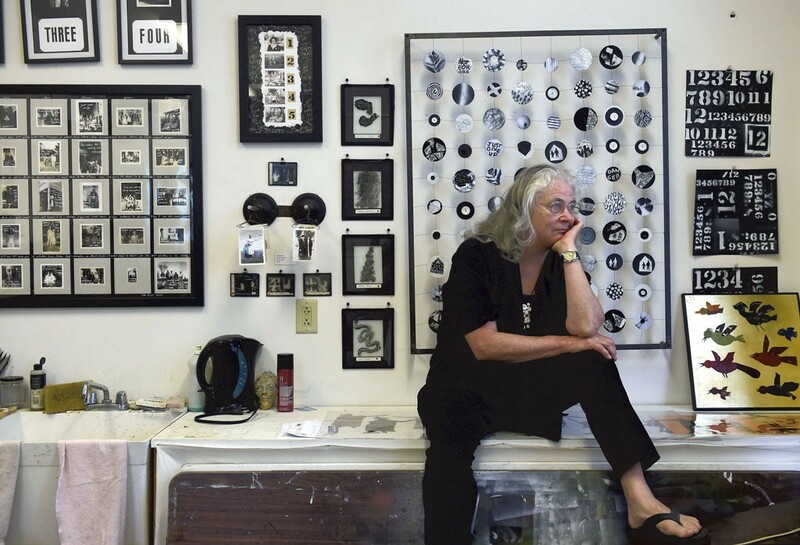 "When you see something that she's made, you know it's her," commented Montpelier artist and curator Mary Admasian, who selected Van Fleet for inclusion in the Vermont Arts Council Spotlight Gallery's "Artists to Watch" exhibition last spring. Van Fleet's practice has long involved incorporating found materials, including black-and-white photographs, into conceptually heavy and often fetish-like constructions. "I guess I'm an appropriator in many ways," Van Fleet commented during a studio visit. A fixture of the Vermont arts community, Van Fleet, 71, was in her early twenties when she took the first steps in her own journey to becoming a working artist. As an undergraduate in 1965, she quit the School of the Art Institute of Chicago because, she said, the overwhelming sentiment was that "art is painting." Raised in Santa Fe, N.M., by parents who were, among other things, toy makers, Van Fleet found she couldn't stick to flat surfaces. "I'm not really interested in taking a 3D thing and making it into a 2D thing," she said. "It makes me uptight to draw." Switching gears, Van Fleet completed her undergraduate degree in psychology and did graduate studies at the University of Michigan; she got married, and then divorced, along the way. But she "couldn't get religion" about her studies, she said, nor about the staid, stable life she saw ahead of her. "I started seeing my future unrolling in front of me," Van Fleet said. "I just freaked out. I just couldn't stand seeing that life." So she and her current husband, R.D. Eno, embarked on a travel stint that took them to Morocco, Spain and Denmark and more. While living in a Danish workers' cottage, Van Fleet apprenticed herself to a roof thatcher. What she thought would be a six- to eight-month excursion spanned more than four years. The couple eventually had to leave Denmark when their visas expired. They sought employment in New England, where they would have access to New York and Boston. In 1976, Van Fleet and Eno settled in Cabot, Vt., where they took the reins of the now-defunct Country Journal — Eno as a writer, Van Fleet as designer and manager of paychecks. After she gave birth to her son that year and her daughter in 1981, Van Fleet earned her master's in education at Goddard College. She then took a job in a multiage Montpelier classroom. In 1996, Van Fleet took a leave of absence from teaching to dedicate herself to her first major artwork: "A Guided Tour of Dante's Inferno, and Hell." She created the 9-foot-tall, 12-foot-wide installation — arguably her first existential processional — using grant funds from the Vermont Arts Council. 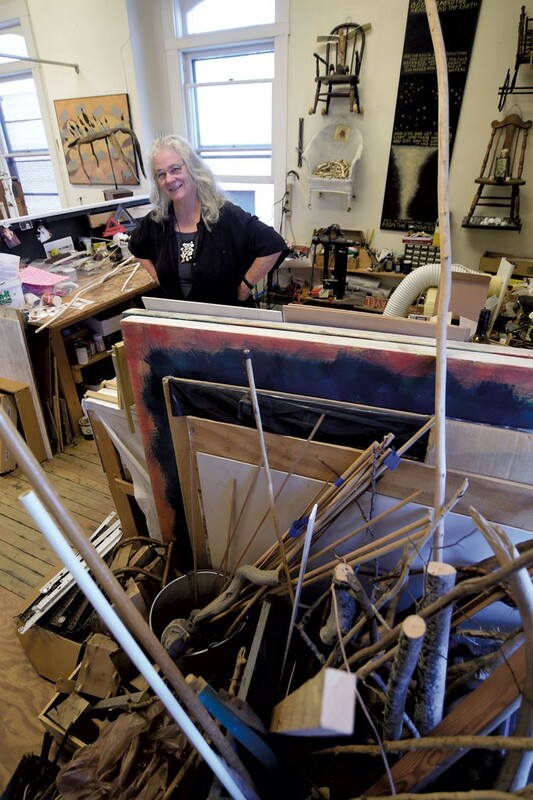 "It was an insane thing to do," said Van Fleet, who exhibited the work at a handful of venues, including her St. Johnsbury studio, a state teachers' convention and Burlington's Flynndog gallery. She said she laments not showing the work more widely; it currently sits, disassembled, in a Danville storage unit. That same year, Eno's father passed away. The couple inherited enough money for Van Fleet to make building her art career a concerted, full-time effort. She drew up a five-year plan and aimed to double her income every year. For at least the first few years, Van Fleet said, she met this goal. "Getting shows in Vermont is not that hard; getting gallery representation is a different thing," she commented. Van Fleet's works appear perennially throughout Vermont — including an average of three times a year at Barre's Studio Place Arts, which she cofounded. In recent years, she has shown works at Montpelier's Local 64 and the Front, Burlington's Amy E. Tarrant Gallery, Stowe's Helen Day Art Center, and Randolph's Chandler Center for the Arts. She's currently working on a spring 2019 solo show for the Vermont Supreme Court Gallery in Montpelier. Though she has not returned to full-time employment, Van Fleet supplements her income through consulting and curatorial work, as well as leading art-making workshops for Hardwick-based Grass Roots Art and Community Effort's nursing home program. She estimates that through art sales, teaching, grants and curatorial projects, she's able to bring in between $15,000 and $18,000 annually. Van Fleet has not been one to shy away from ambitious projects, and her energy seems boundless. In 2009, she and artist and former Seven Days art critic Marc Awodey (now deceased) launched Vermont Art Zine, a website featuring exhibition listings and reviews. (They handed over the publication to writer and Seven Days contributor Meg Brazill in 2012; the last post went up in 2014.) Van Fleet maintains an active blog about her practice and has contributed reviews to Art New England. Perhaps her biggest undertaking was launching Studio Place Arts. In the late '90s, she worked with the Barre Historical Society and a cohort of area artists to purchase the neglected Nichols Block building on Main Street to the tune of $850,000. SPA opened its doors in 2001, and Van Fleet briefly served as executive director in 2003. The organization eventually hired current executive director Sue Higby. Van Fleet is still active on the board and gallery committee, maintains a studio in the building, and curates one SPA show annually. "She's a force — she fetched me," said Higby. "A good word for Janet would be 'fearless.' Or 'courageous.'" "Janet is her own person," said Admasian. "She's an activist; she's caring; she's very present in her life." Using the arts to promote social justice has been a central focus for Van Fleet. Her work frequently addresses concerns about dehumanization and ecological destruction. Last summer, she curated "Social Justice in Race, Gender, Immigration and the Environment," a group exhibition at Goddard College. She has been on the steering committee of Reading to End Racism since 2014. "Racism has poisoned the well of this country," Van Fleet said. "What can I do to fix that? I don't know, but I think we're responsible for trying to." In "Long Haul," the piece "Untitled (Black & White)" most readily evidences Van Fleet's sensitivity to color lines. As if mirroring each other, a series of white objects faces a series of black ones: small dishes, plastic coffee lids, gloves, elephant figurines and others. Painted skeletons with ribs scratched into the wood bring up the rear of each procession. Though she has worked hard to sustain her life and career, Van Fleet readily acknowledges the privileges that have made her work possible. "What does it mean when it's so impossible to make a living as an artist that the only people who can afford it have independent resources?" she asked. "It's wrong in terms of the culture, because the only voices you are getting are [those] privileged voices." Fueled by idealism and indignation about the world — along with healthy doses of gratitude and curiosity — Van Fleet shows scant signs of slowing down. Like the linear parades she has assembled for AVA, she keeps moving forward. "I have not been in a rut at all," she said. "I like that I don't know what's down the road." The original print version of this article was headlined "Moving Forward"